Spiky obsession: Packing up: part 2. The good weather has continued and it has been lovely out in the garden for the last few days. It would be easy to forget things need to be packed up. I have been mixing my days between enjoying the sun in the garden and local parks and slowly moving plants into the other rain shelters. The second cold frame is up. This one contains the plants that just need the rain keeping off and will benefit from a little bit of extra warmth. 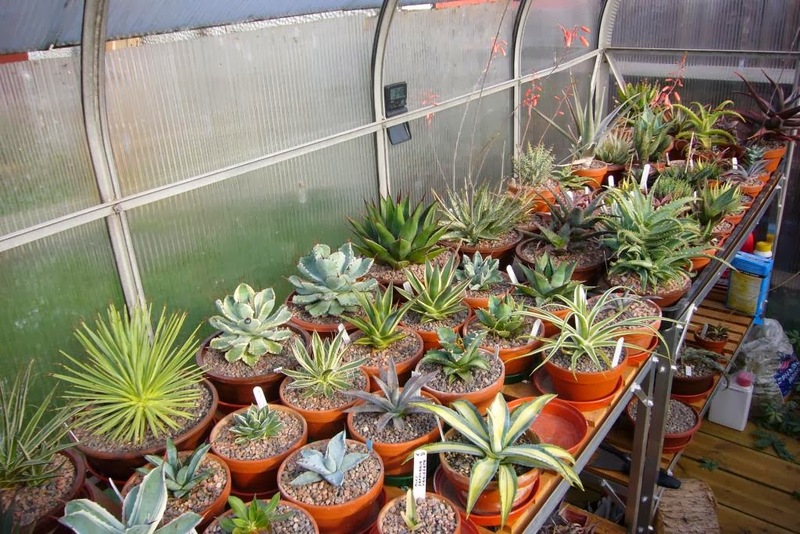 Many of the plants in here were in the old dry bed and will be planted in the new one. Until it is ready they are getting pampered. Next up was starting on the greenhouse. 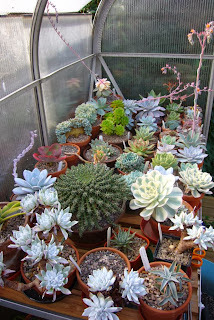 This is my first summer with a greenhouse and I have spent a lot of time pampering the plants in there, ensuring I remember to water (a first for me) and generally watching their progress. 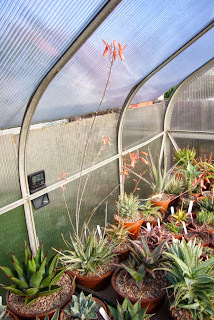 It has been a very good year for aloe flowers, I think they have all flowered which is a first. Sadly the flowers confirm that the plant bought as aloe firebird, is in fact aloe lizard lips. Not one I wanted, although it does flower profusely so good for some colour. The echeverias don't want to be outdone, so are still flowering as well. We are into the late flowering varieties now, especially some of the white forms. It's strange, starting to move some of these plants into the house felt much more definite than the rest of the packing up. These are the plants that will be damaged by frost, so I guess it means I know they are on the way. The first windowsill is full and plants have started appearing on the other one that is not being ripped out. A few of the bigger aloes have moved in as well, I've yet to figure out where they are going to end up. They are sitting by a glass door at the moment and will be moved when the building works starts. It gives me time to find somewhere to put them. Hey Spiky! Looking good. I wish I had the room for those green houses (they look amazing). I just moved from Texas to Spain a few months ago, and am learning what to do with my new plants during the cold wet winters here (gets to -5C at night). 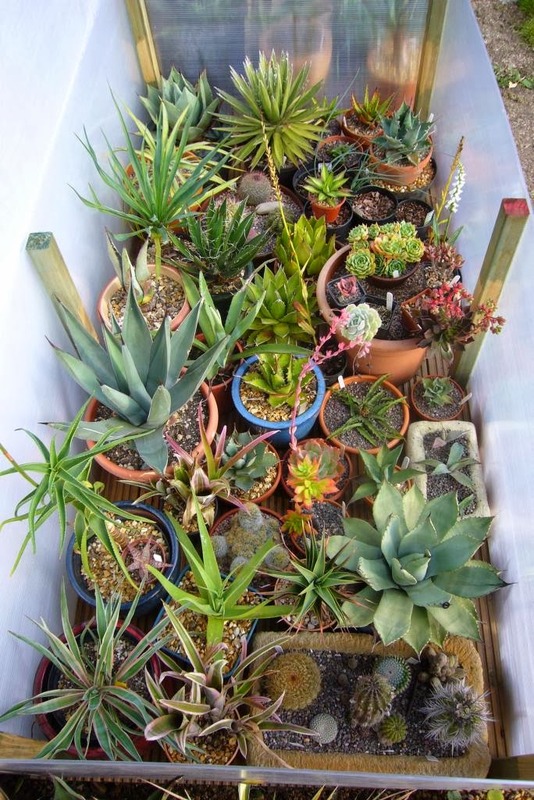 I have brough all my cacti inside on some book shelves and am letting them go dormant. 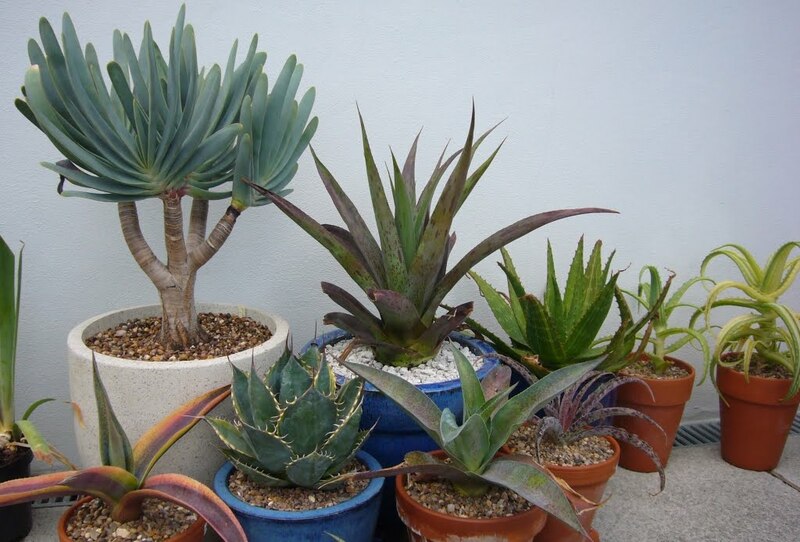 Here is the question for you, do you water your Aloes, Hawthornias or Echeverias durring the winter? I keeping trying to remeber if Aloes are winter growers or not, and if they need to be kept watered. Thanks for any adice! Hi Steve, With the exception of Cacti, I tend to give all my other plants a tiny bit of water after about 2 months of being brought inside. I think this stops them going too dry and having to recover come spring. I does depend a bi ton light though, and if you have somewhere bright on a sunny windowsill, I would water one a month. What are the signs of your plant addiction?